Multibagger stocks are stocks that generate multi-fold returns for the investors. Multi baggers are wealth creator stocks. These type of stocks can make you wealthy in a short period of time. Incredible right! Read on – A stock of Infosys appreciated multiple times since the launch of IPO. If you have invested just 10K in this stock during initial public offer in 1993 you could have made Rs.4.57 Crores today! Thus we can say Infosys is a multi-bagger stock. Apart from Infosys, there are many other stocks that have generated very good returns over the long run. The historical performance of company should be good. A company should be preferably in mid-cap and small cap area. The company should be operating in a space where they are delivering unique product or services. The demand for these products and services are high and competition is low. The company should have a good source of earning with scalability in operation. The company business model should be sustainable and should have favourable future business potential. The valuation of stock should be low. The management of a company should be highly committed and able to take the company to new heights. The Company should have low debt or be debt-free. Business expansion, a global market presence or new monopoly product could be added advantage. 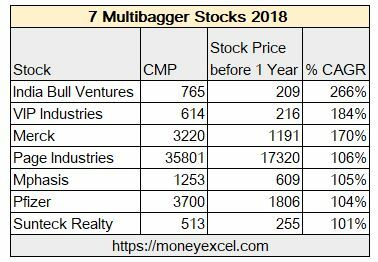 After getting understanding about multibagger stock let’s take a look at 7 Multibagger Stocks that have generated 100% returns in last one year. India Bull Ventures offers online stock market trading platform. Apart from stock broking India bull is also instrumental in other business such as real estate, loans, mutual funds and tax planning products. India Bull Ventures has turned out to be multibagger stock last year. India Bull Venture has generated 266% returns for the investor last year. India Bull Ventures financial has improved a lot in last few years. This company has good presence all over India. Brand value of this company is also good. VIP Industries is next multibagger stock in the list. VIP Industries has generated 184% returns in the last year. VIP Industries is leading suitcase manufacturer in India. Although VIP Industries has generated very good returns last year, it seems to overvalue stock as of now. Carryout proper fundamental analysis before entering in VIP Industries. Merck is one of the leading science and Technology Company. Merck provides solutions in healthcare, life science and performance material. Innovative products and advance research and development facilities are positive points about this company. In last year Merck generated 170% returns for the investors. Page Industries is next in the list of multibagger stocks. Page Industries is one of the favourite stock of Rakesh Jhunjhunwala. Page Industries is also known as Jockey India. They are only licensee of Jockey International. They are dealing in monopoly products. Page Industries has generated 106% for the investors last year. Mphasis is well known name in Information Technology space. Mphasis provides IT services to end customers. Financial results of Mphasis is very good. The stock of Mphasis has generated 105% return for the investor last year. Pfizer is one of the leading pharmaceutical company in India. Pfizer offers many innovative medicines for treating various diseases. A stock of Pfizer has turned out to be multibagger stock last year. The stock has generated 104% return for the investors. Sunteck reality is real estate property developer in India. Sunteck reality is expert in luxuries and ultra-luxuries residential projects. Sunteck Realty has generated 101% returns for the investors in the last one year. 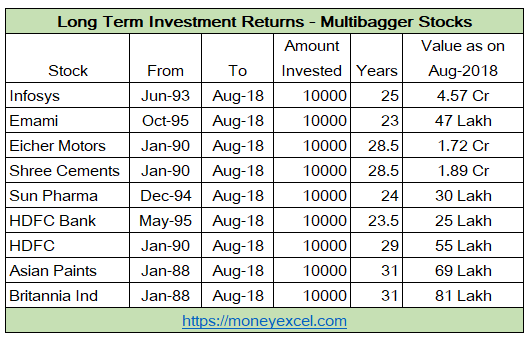 Note – Above companies has generated multibagger returns last year this does not mean that it will give similar returns in future. This article is written to explain that good stock generates very good returns over the long run. Investors are requested to carry out through analysis before investing in above stocks. You should also note that Pfizer and India Bull Venture is now part of ASM list.